Andrea Vollaro was born in Gragnano Italy on September 14, 1871. He was the fourth child of Sabastiano and Filomena Di Soma Vollaro. When Andrea was a young man in his 20's, he would walk several miles to the village of Ajerola to court Luisa Acompara. They were married in 1893 and on August 12, 1893 they emigrated to the United States. They settled in Brooklyn NY. Andrea worked for a tanning company, sold vegetables from a horse drawn wagon and eventually opened a shoe store. They bought a house at 1094 Coney Island Avenue and lived there while they raised a family of 6 children. Their children were Charles, Joseph, John, Nina, Elizabeth, and Andrew. Two daughters were stillborn before Charles was born. Andrea made, sold and repaired shoes until he was in his 70's. After closing the shoe business, he sold olive oil, cheese, and other Italian food to a small group of clients. He got the food from his brother Vincent who ran a food import business in New York. After retiring, Andrea spent the summers in the Adirondack mountains where the family owned some property on Schroon Lake. He ran a small motel on the property where there were 5 small cabins. 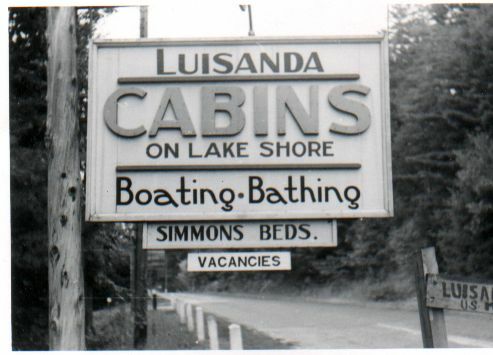 The property at Schroon Lake became a favorite vacation spot for the Vollaro family for many generations. It was named Luisanda, a combination of the names Luisa and Andrea. Andrea died June 17, 1956 at the age of 85. He is remembered for his easy going nature and humorous stories. Luisa Acompara Vollaro was born March 14, 1873 to Juliano Acompara and Theresa Criscuolo Acompara. Her family lived in the town of Agerola Italy, near Naples. When she was 20 years old she married Andrea Vollaro from the nearby town of Gragnano. In August of 1893, shortly after their marriage, they emigrated to the United States and settled in Brooklyn NY. Her first two children died at birth or shortly after. She went on to raise 6 healthy children through the years. The family was poor initially but the children all went to work at an early age and brought home their pay. Luisa was frugal and she kept tight control of the family finances. She pooled the incomes to make ends meet and managed to make a number of shrewd investments in the stock market. By the time the market crashed in 1929, she had amassed a sizable fortune of more than $250,000 only to see it suddenly disappear. She held on to the better investments through the depression years and they recovered about 20 percent of their peak value. Luisa exemplified the strong will and resolve of many of the emigrants who persevered through hard times to survive and prosper in a new world of their own making. She died October 27, 1935 in Brooklyn at the age of 62. She was survived by her husband Andrea and their 6 children, Charles, Joseph, John, Nina, Elizabeth and Andrew.